Help - Not launching in Full Screen? I have the latest version of TDM, but the game launches windowed despite enabling full screen in the options. Any ideas what could be causing this? Please select a low screen resolution, like 800X600, set full screen and restart the game. Test if it get on full screen. If so, set the screen resolution and aspect ratio to your taste. Which screenresolution and aspect ratio do you want to select? Edited by freyk, 07 July 2018 - 06:56 AM. 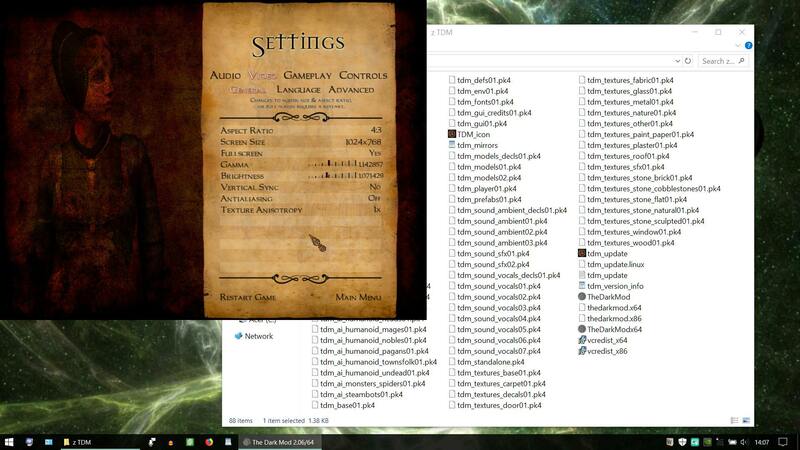 Also, try to disable AA from the video settings. Alt-enter worked but stretches my screen beyond the proper 4:3 aspect ratio. I had the same problem with my 4k. Since all programs became too small for me, I increased Windows' own scaling. TheDarkMod probably can't handle this. 1920x1080 isn't 4:3, it's 16:9. Are you using an onboard intel GPU? If you are, then you'll have to set TDM to use your monitor's native res in fullscreen or it will do what you're seeing. At least, I have this same problem at work on the iGPU. Im using a GTX 950m - Is there a setting in the GTX control panel that will get around the problem I am having? EDIT: And if you can and do have the option, disable Optimus tech. It works okay with DX games, but OpenGL not so much, so it's possible that the laptop is using the intel GPU. I'm having the same problem for a much more frivolous reason. I have a 3840x2160 (4K) monitor, and really enjoy the extra resolution for day-to-day usage and gaming when possible. However, I usually prioritize maintaining a solid 60 Hz frame rate, and enjoying a game's best graphical flourishes (in that order), over squeezing a pixel-perfect rendering out of my hardware. TDM 2.06 has actually proved to be really fantastic in that respect. The game for the most part looks and runs great in 4K. The only problem factor is the Soft Shadows. My GTX970 can't quite hold 60 fps in 4K with them turned on. Given my priorities, I'd prefer to reduce resolution to 1920x1080 in order to fully enjoy the beautiful lighting. But like the OP said, TDM does not properly respect the full screen option. The Alt-Enter fix "works" but, judging by the frame rate hit, it does so by covertly increasing the game's rendering resolution to match the monitor's native, instead of up-scaling the picture to the proper dimensions. Does anyone have any suggested fixes? Manually changing my display resolution in Windows 10 options, each time I want to play TDM with Soft Shadows, is not my cup of tea. Edited by ChronA, 01 September 2018 - 07:04 AM. Thanks duzenko. Although that tip didn't directly solve my problems, it did lead me to the right documentation. For anyone having similar issues, what ultimately did the trick for me was going to TheDarkMod.exe>Properties>Compatibility > Change_high_DPI_settings > High_DPI_Scaling_Override where I checking the box for "override high dpi scaling behavior" and selecting "application" from the pull down menu. Currently I'm running in 1920x1080 fullscreen, on all maxed settings (except AA of course), and getting good performance. I have noticed some minor shadow flickering from turning off FBO, but it's not a big deal. Considering turning off FBO also cleared up a graphical glitch I was getting where some water surfaces had periodic horizontal black lines and extra layer of texture, I consider this a win. Plus it sounds like a lot of these issues will be getting fixes for the next update. So thanks again.